Morley's Dan Cammish. Picture: Dennis Goodwin/Network Images. Morley driver Dan Cammish wrapped up the first title of the British Touring Car Championship season after securing an unassailable lead in the Jack Sears Trophy at Silverstone yesterday. Drivers are eligible for the trophy if they enter the season having not clinched an outright podium finish before and rookie Cammish’s impressive efforts for Halfords Yuasa Racing so far this year ensured he was in pole position to claim top honours at the Northamptonshire circuit. Leeds' Sam Tordoff celebrates after winning the first BTCC race at Silverstone yesterday. Picture: Paul Horton Motorsport Photography. Although enduring a tough weekend at Silverstone, Cammish enjoyed three points-scoring finishes which meant that his nearest rival Chris Smiley could not catch him in the trophy competition. 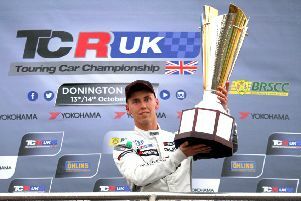 “It’s terrific to seal the Jack Sears Trophy in my rookie BTCC season,” Cammish said. “The drivers that have won the title in previous years have gone on to achieve great things so I hope this will be the first of many big BTCC trophies with my name on! It was also an excellent day for Leeds’ Sam Tordoff who claimed victory in the first race at Silverstone – his maiden race win of the season. 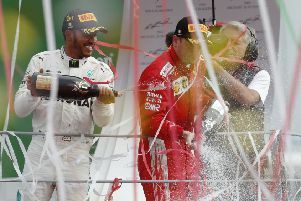 He then backed that up with third place in the second race which moved him up to 10th place in the overall standings – eight points ahead of Cammish in 11th. The final three races of the season take place at Brands Hatch on September 29-30.